Customer churn is a massive challenge for providers of mobile phone plans, and prepaid customers are the most churn-sensitive of all. 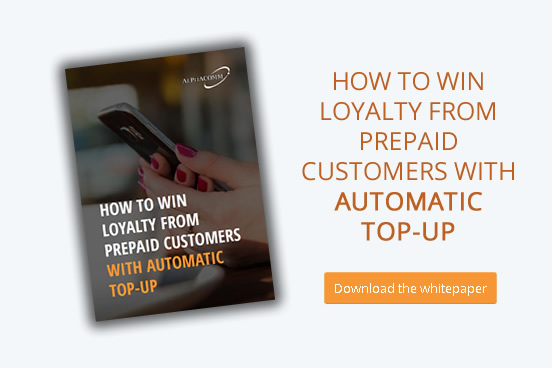 So, let’s look briefly at the dominant trends in the prepaid phone sector and discover which steps your company can take to boost customer loyalty. Competition is intensifying in the mobile phone industry, but perhaps nowhere more fiercely than in the prepaid sector. Many markets are almost saturated, and wireless telecom providers wrestle daily for customers. And prepaid customers—who don’t have a contract, of course—are the easiest of targets. The result of all this competition? Wireless telecom markets are becoming more efficient, growth is stagnating, and primary services are becoming commoditized. In other words, the differentiation between your prepaid solution and your competitor’s is becoming less and less meaningful. And if that’s the case, why should your customers remain loyal to you when your competitor down the road has a cheaper prepaid plan? It’s no wonder that revenue growth per user is getting harder to find and margins are becoming thinner than a SIM card. The risk of commoditization to wireless telecom providers is real and it’s big. According to Strategy&, PwC’s strategy consulting group, wireless telecom markets in developed economies are more commoditized than those in developing economies. All wireless markets around the world are somewhere on that slippery slope toward commoditization. In its report “An industry at risk: Commoditization in the wireless telecom industry” (Feb 2017), Strategy& explains that the trend toward commoditization could lead to wireless operators becoming little more than utilities. And once that happens, pricing options will narrow critically. 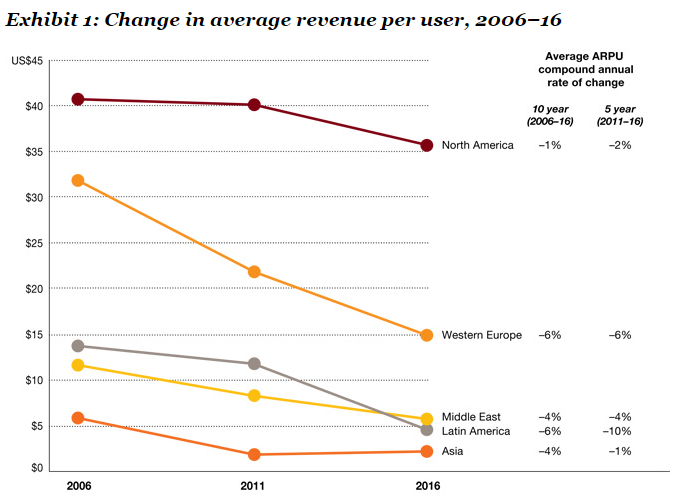 The graph from Strategy& below, illustrates the decline of the average revenue per user (ARPU) in the wireless telephony industry. It’s certainly a worrying trend, particularly for those operators in more mature markets. Strategy& includes Belgium, Italy and Hungary among the countries already in the commoditized zone, and it defines Germany, the UK and the Netherlands as ‘on the edge’ (i.e. the difference in market share and ARPU between the highest and lowest players is less than 50% and, although there is still some price differentiation, a decreasing market share is pushing the market ever closer to commoditization). But is there a way to avoid the commoditization pitfall? 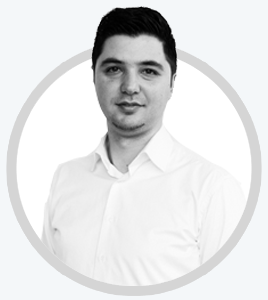 Strategy& and Alphacomm believes there is. Basically, you have to be willing to take action to differentiate more clearly your product and service offerings. In the prepaid market, that means making it as easy and as simple as possible for customers to top up their phones and providing a range of value-added products and services. New prepaid sales channels like online and mobile are set to overtake traditional retail channels in the foreseeable future. Convenience is the name of the game. Millennials and now Generation Z, who grew up with social media, smart phones and apps and spend more time communicating digitally than they do in person, expect instant gratification in their daily business transactions. Netflix and Spotify are perfect examples of companies fulfilling those high expectations by providing subscribers with unlimited and immediate access to programs, movies and music. 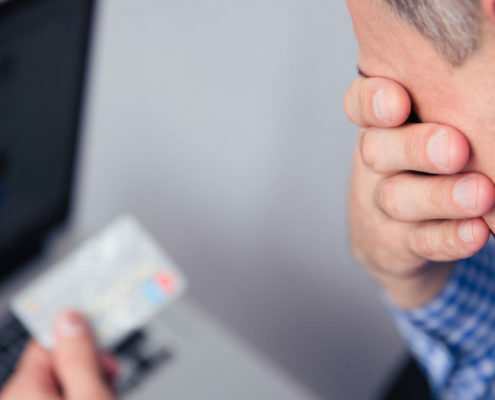 Even banks, not known for their readiness to break with tradition, have been forced to give customers on-the-spot satisfaction with their internet banking services. Likewise, consumers of prepaid phone plans are no longer prepared to make their way to the local store on a rainy Sunday afternoon simply to top up their phone. They want to reload their credit instantly while at work, in the train, in the bath and in bed. 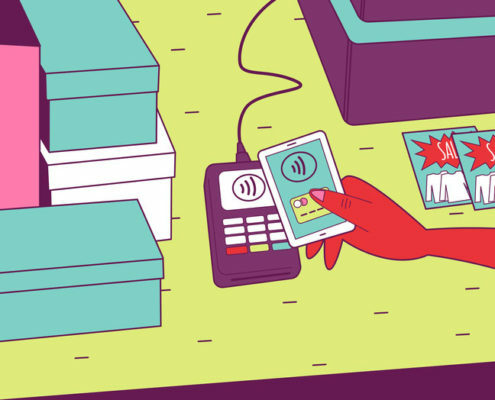 So, online top-up merchants are popping up all over the place, letting prepaid consumers refill their credit in seconds on their favorite device. All they have to do is enter their mobile phone number, choose their mobile operator and top-up amount, and pay. It couldn’t be any easier. Or could it? The ultimate top-up platform is undoubtedly your own customized web and app solution. The advantages to telecom operators are considerable. 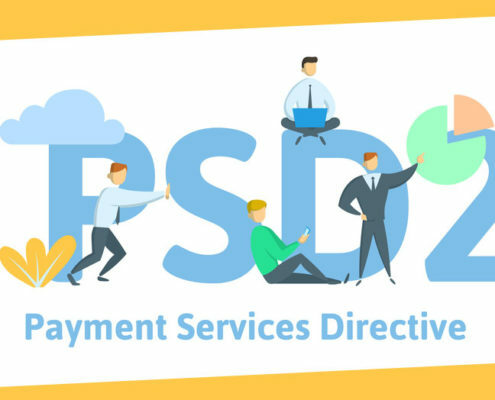 Branded solutions provide guaranteed data security, a wide range of national and international payment options, and an interface with your front-end designs. Why send your customers off to another website or app to reload when you can offer a seamless customer experience and be rewarded with more loyal customers, higher ARPU and reduced churn? Your own web and app top-up solution gives you the ability to perform customer profiling and segmented campaigning. That, in turns, lets you communicate directly with your customers via push and in-app messages. And that leads us neatly on to the third trend. There’s an expectation among consumers these days that brand loyalty should be rewarded. Whether it’s getting a free tenth cup of coffee at our favorite cafe or bonus points at our local grocery store, we like to feel our custom is valued. Sell us a quality product or service and give us a little extra as a thank you, and we’ll probably keep coming back to you. He gives Amazon Prime, Hilton and Starbucks as the perfect examples of how some companies are making it much more convenient for their customers to do business with them. And customers are loving it. The key to their success, explains Schneider, is not the discount their customers are getting but the experience they’re undergoing. So, are telecom operators following the example of Starbucks & Co? It seems so, although it’s still early days. The larger players have started going beyond the standard offering of free minutes and extra data. They’re giving prepaid customers a familiar and consistent environment via branded web portals and apps. Now these customers can do the same things postpaid customers can like viewing their transaction history, setting up automatic top up and managing their account details. But the incentives don’t stop there. Some are offering benefits like data, minutes and text bundles combined with free EU roaming. Others enable recurring and automatic top ups so customers never run out of credit. Virgin Mobile, among others, even lets its customers top up the accounts of friends or relatives. 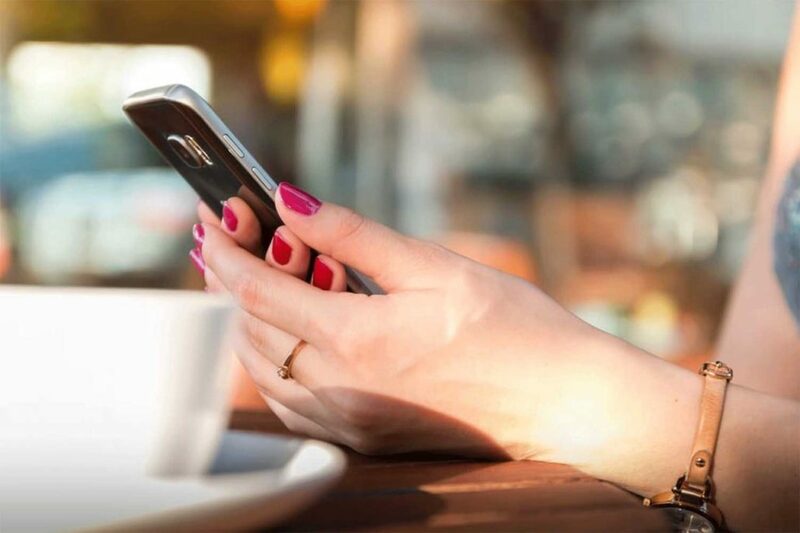 Vodafone UK goes a step further and gives customers opportunities to interact with the company and other customers in its a ‘Pay-As-You-Go Community’. Here, prepaid customers can discuss their app, bundles, devices, rewards and more. Is it time your company started nurturing prepaid customers?